Very well-made, substantial set. I’m just “ok” with the pattern. It’s simple, well-done as far as consistency, and pretty low-key. We’re getting these before the listing page is even done, so I couldn’t see details of the pattern til they arrived. I don’t know what pix they’ll end up using, so I’ve added a few of my own. Really like the Amazon Basics line These are a simple clean basic set, but not cheap looking. They will blend in with most everything, having a subdued traditional style. The interesting piece is the Amazon Basics logo is layered into the edge of the knives (like every other brand does, just seems bit silly to have the Amazon logo there). Really like the Amazon Basics line, good ‘store’ brand of things that are good value, would prefer to have it completely unbranded though. Good silverware, questionable counting… The silverware and service set are very sturdy and a good size. The reason for only 4 stars is that the person who counted the pieces either miscounted twice or couldn’t see / feel the difference between the small fork and the large fork: there were 11 large forks and 13 small forks in the box. Amazon promptly sent a replacement set. 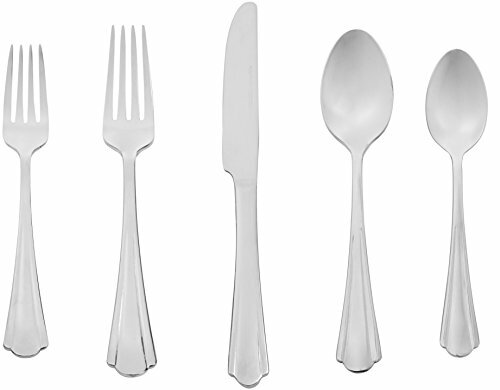 Make sure to count each piece to be sure you actually get the right number of each utensil.